Swinging Stage Scaffolding is an ideal solution for Glass and Balustrade Replacement. Swinging Stages are time efficient and versatile. Need access to the outside of a high-rise or multi-story dwelling? Too high for static scaffolding to be affordable? Consider a swinging-stage installation to provide quick access for a range of renovation and restoration works. 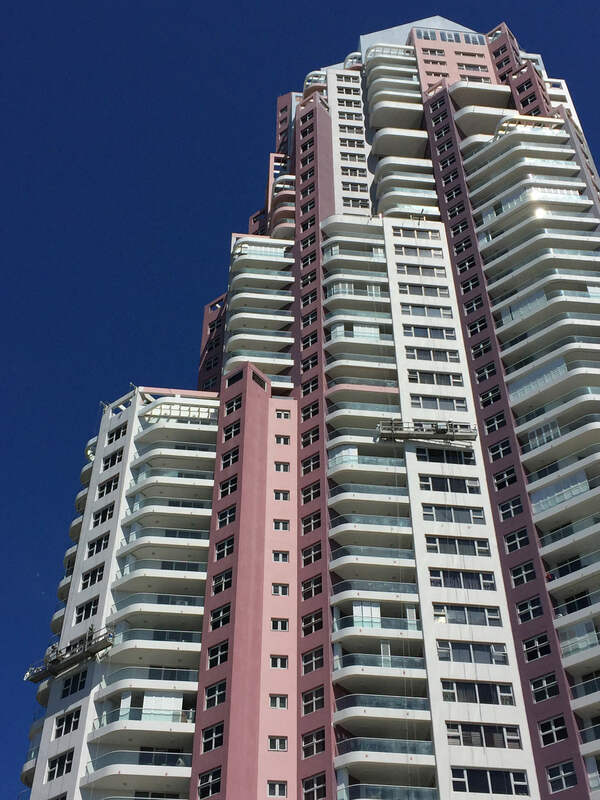 With crews available right across Brisbane and the Gold Coast, we can install, relocate and recover a solution that works for you. Whether you’re familiar with the term or not, you’ve no doubt seen swinging stages in action. Popularised on television with the window-washer working on the outside of an office, peering in, swinging stages are the ideal choice for any work involving the sides of high-rise buildings. Swinging stages are attached to an anchor on the roof of the building and suspended via steel cables. These cables controlled by a winch, allowing the platform to move up and down the face of the building and providing easy access. With a modular system, such as we employ, swinging stages can be used on all manner of building facades, including corners and curved sections. Given the heights often involved when working from a swinging-stage, safety is of crucial importance. Access to the swinging stage should be kept to roof and ground level only and fall arrest devices used by all workers. It is also common for overhead gantries to be installed at ground level over any common access directly in the fall line of the swinging stage. Cost effective for tall buildings – Swinging stages are very effective for access to heights where use of static scaffolding can be cost prohibitive. Quick to install and dismantle – Only requiring fixing to appropriate anchor points and cabling, swinging stages can be erected quickly and without hassle. Great for jobs over variable heights – The ability to change heights at the press of a button makes swinging stages the go-to choice. High level of safety – With guard rails and combined with netting and a fall arrest system, a swinging stage can provide safe access to heights. Configurable for non-sheer walls – Thanks to their modular constructions, they can be configured to provide access to many awkward building shapes.